Create your very own Teddy Bear and other stuffed animals at the Build-A-Bear Workshop! You can choose, stuff, stitch, fluff and dress your new furry friend. Each Teddy Bear and stuffed animal will have it’s very own heart inside. Grab your loved ones and visit Build-A-Bear Workshop and unleash their imagination. When all they’re focused on is creating their new best friend, you can focus on collecting those heart points later on. Buy Build-A-Bear discount gift cards and save before you create. Shopping Tips: Build-A-Bear Workshop does not expire and have no additional fees. Below is a listing of our favorite places to buy Build-A-Bear Workshopgift cards. There are always great deals and discount available when buying these so check back often. We will keep this list updated to reflect the best rates when possible. Do you have a child with a birthday coming up? 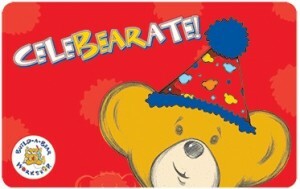 Help make it a celebration to remember by purchasing discounted gift cards for Build-A-Bear Workshop today! Buy a discounted gift card to create that special Teddy Bear. Read more on Gift Cards Discount Rates.